Los Campesinos! Live! by Christoph! Christoph! presents Los Campesinos! live and in concert. Nice, I like the realistic brick wall. Unfortunately, the brick wall isn’t LEGO. I was in a rush earlier this morning when I was first posting this, and didn’t note that some of the elements in this scene aren’t “pure LEGO” — I only added the “Custom” category to the post at the time. 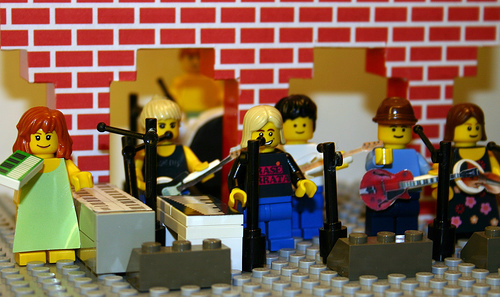 :-) But the wall isn’t LEGO, and most of the instruments and clothing are stickered. Man, I got so excited when I saw that wall. I thought there was some incredible new technique I could learn. Ah well, it’s a nice dio regardless. Thanks for posting the photo! As Dunechaser already wrote I used a lot of stickers.